Last week our box from Blaencamel Farm looked like a picture of autumn itself. Whilst new crops like squashes are being harvested some of the summer crops like the last of the tomatoes and chillies are still going. The greens, such as Cavolo Nero, are a darker shade. My seasonal compass is navigated towards deeper flavours, with spice combinations that help us transition seasons comforting us during the first frosts. This dish I cooked and loved a lot last year. It grew from my fascination with how spices and ingredients fuse and connect culinary cultures. And it uses some of my most loved ingredients. Dill as herb much loved in Northern Greece where I am from but also prolific in Iranian and Ukrainian cuisines. Cumin for us Greeks of the eastern side (just a pinch mind). Caraway, a key spice for the soothing borscht and much Ukrainian cooking. Sour grape powder typical in Iranian cooking. Goji berries instead of the Iranian barberry. Turmeric, ginger, beetroot, pomegranates, tomatoes, parsley… You can see where this is going. It’s a tasty cure on a plate. You can replace some of the fresh turmeric and ginger with powder although I think it is much nicer when fresh is used. I serve this dish with brown rice. Place the goji berries in citrus juice for the duration of the preparation. Peel and grate or cube the beetroot. If using cooked beetroot cook an hour before prep starts. Halve the squash and remove seeds with a tablespoon. Peel, slice and cube in 5 cm chunks (not too small). Stir fry the onion, 1 tsp salt and spices (cumin, caraway, paprika, turmeric, ginger and sour cherry &chilly if using) for five minutes on low heat to soften and release aromas. Add the garlic and oregano stir fry for a couple more minutes. Add the squash, beetroot and beans and stir well. Add the softened goji berries with the citrus juice, the chopped dill and parsley. Stir well. Add the hot water or stock with another tsp of salt. Stir well, cover and simmer for thirty minutes. Then add the greens and simmer for another fifteen minutes. Enjoy with a dollop of Greek yoghurt, walnuts and honey and pomegranate seed or apple if you fancy a fruity taste. This entry was posted in Recipes, Vegetarian and tagged autumn recipes, beetroot recipes, blaencamel farm, Cardiff, greek, healthy food, iranian, Lias Kitchen, organic, recipe, seasonal food, squash recipes, ukrainian, Wales. If you are left with little pieces of chocolate eggs or you want to make the most of Easter chocolate on offer at shops this week this easy and quick dessert recipe is for you. It requires no baking and it is a great one to make with the kids, who I am sure will be quite happy to help you smash those biscuits! Kormos, which means tree log in Greek, is unlike the baked chocolate log recipes you know. It uses crumbled biscuits, roughly chopped nuts, melted chocolate to make a delicious dessert that does not need baking and can be frozen for a while if you would rather not eat any more chocolate for a while. Melt the chocolate with the cream, the liqueur and the icing sugar and melt in a bain marie. Remove the melted chocolate mixture from heat and cool down. Roughly chop or crush the almonds and the biscuits. Mix the biscuits and almonds well in the mixture. Line a bread baking tin with baking paper making sure there is enough excess paper on all sides to fold around the mixture. Pour the cooled down mixture in the tin and fold the baking paper neatly around it. Refrigerate overnight or at least for 2 hours on the coolest shelves of the fridge. You can speed up the process by adding the mixture in the freezer for an hour. Once the mixture is cooled down and more solid you can remove from the tin, wrap in cling film and then refrigerate or freeze. Before serving, dust with some cocoa powder and slice to serve. If you have less chocolate you can still make this dessert. For 150g chocolate (half the amount in the recipe) add ¾ cup evaporated milk and 3 tablespoons cocoa powder. There are many ways to make this dessert, you can swap the cream with a tin of condensed milk if you are using dark chocolate. Just make sure you remove the icing sugar and add about 100g butter too. It is also possible to make the dessert without any chocolate – just replace the cream and chocolate with 250g butter, 6 tablespoon cocoa power and increase the icing sugar to half a cup. Basically this is a great leftover recipe and you can adapt it to what you have or can afford. You can keep the log frozen – just make sure you take it out of the freezer for 3 hours or overnight before serving. My ‘bain-marie’ is a pyrex bowl placed over a pot of boiling water. 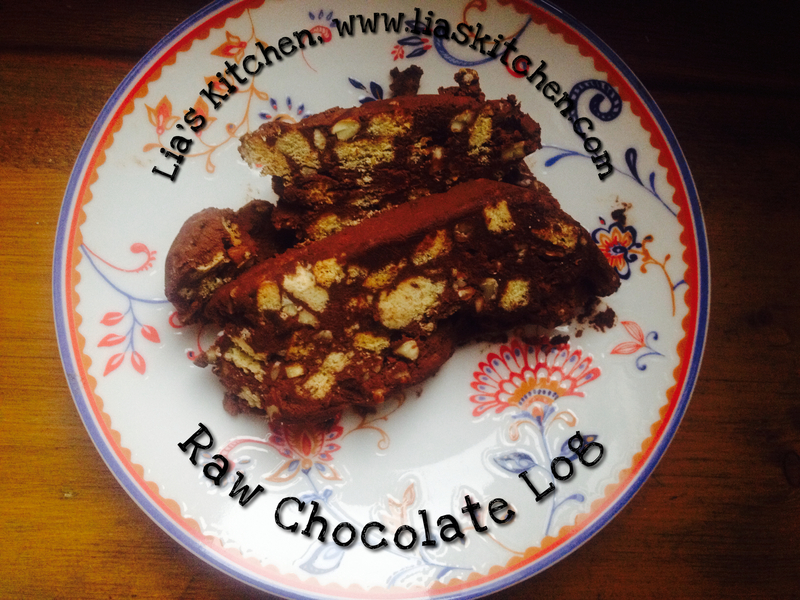 This entry was posted in Greek cuisine, Recipes, Vegetarian and tagged easter, greek chocolate log, kormos, leftover chocolate, raw chocolate log, recipe, what do do with your easter leftovers. This is a recipe for Suzanna and Andre. Thank you for the Easter visit, and the wonderful start to Spring. This sauce will not let you down. You can use it as a salad dressing. It can add sharpness and a crescendo to dips or rice dishes when sprinkled over them as a finishing touch. And for the carnivores it is the perfect companion to roast lamb. The freshness of mint reminds of summer. It is a herb so loved and an essential ingredient in Greek , North African , Arabic but also Caribbean cuisines which are amongst my favourite. Not only does mint pair beautifully with cinnamon, lemon and lime, in drinks , foods and condiments but it’s medicinal properties are renowned. 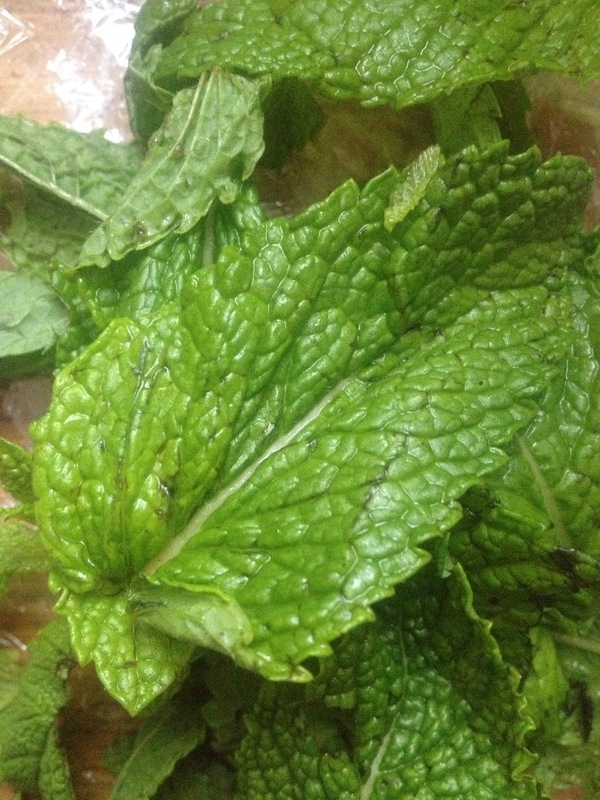 Mint is an antiseptic, it calms stomach upset, it decongests and helps us breath easy, but it also stimulates the mind. Mint has many varieties, plain mint, peppermint and spearmint are the best known. As the summer sneaks in why not try to add mint to more of your drinks and food, it will lift you up and accentuate all flavours like no other herb , trust me. Pulse until the mint is finely chopped and turned into a creamy sauce. Add toasted almonds for an extra special flavour . This entry was posted in Recipes, Vegan and tagged mint, mint sauce, recipe. 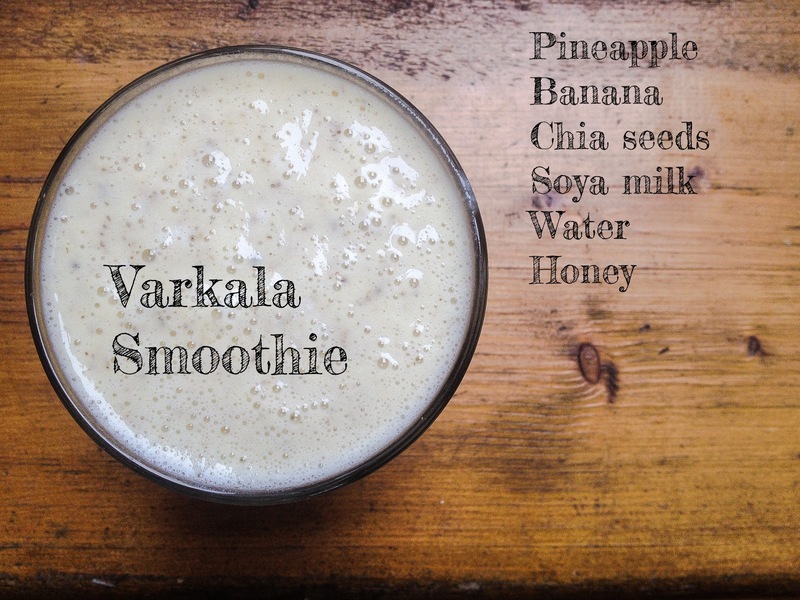 This entry was posted in Recipes and tagged chia seeds, pineapple, recipe, smoothies, soya milk. Quinoa with sweet potato is becoming a real favourite at Lia’s Kitchen both when we are receiving guests but also when we are touring. This is an easy to make but very nutritious dish. It was on our September supperclub menu and last night this was a side dish at our dinner table when our Braunton family visited. I am writing down this recipe for Miss Lyra May, or more accurately for her mom Beth, because she promised me that if her mommy cooks this recipe for her she will keep eating quinoa. Now I know that this nearly four year old lady is a smart negotiator but , my dear Beth, I still think it is worth giving this a go. After all Miss Lyra’s one year old brother never objected at all to eating the quinoa. Boil two cups water and make vegetable stock. Simmer the quinoa for up to twenty minutes, until cooked but not sticky. Add enough olive oil to cover the base of a frying pan. Add the onion and the bay leaf and sauté for a couple of minutes. Add the sweet potato and stir fry until soft -5 to 10 minutes. Add the quinoa , parsley and if you need to some more olive oil. Taste and season is necessary. If you are using citrus juice add last. 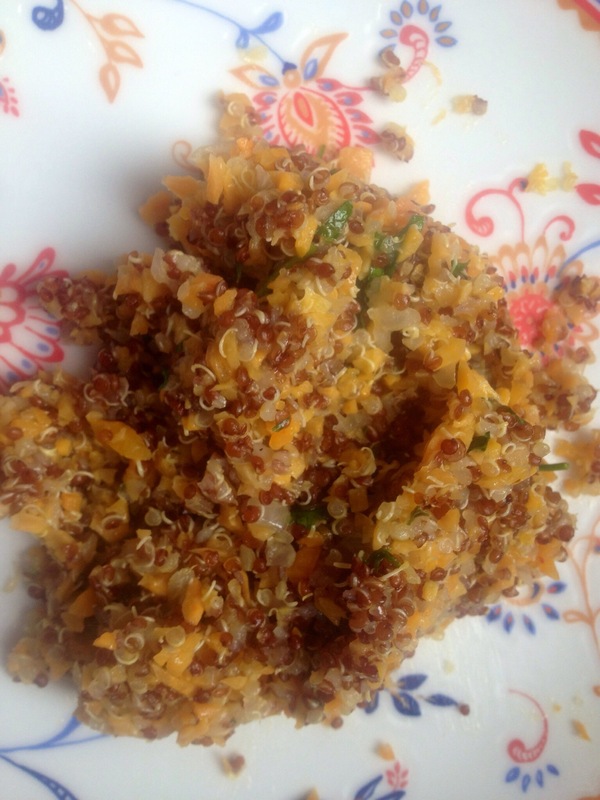 This entry was posted in Recipes, Vegan and tagged easy, food, quinoa, recipe, sweet potato, vegetarian. Shrove Tuesday is now gone but I’d like to think that pancakes can return to Lia’s kitchen before the next one in 2014. Pancakes don’t always have to be overindulgent naughty treats. Not that there’s anything wrong with that. I hope this post becomes a quick and easy pancake recipe reference and an inspiration for an alternative savoury filling. This recipe was given to me by Dan Green who, hat’s off to him, makes the best pancakes I have ever had-he flips them and all that! I just followed his instructions to make the batter, made a filling with what we had in the fridge and watched him put the pancakes together skilfully for us. Stir fry the aubergine, onion and a pinch of salt for five minutes. Add the chopped tomatoes and cinnamon, stir and cook for five to ten minutes on low heat until soft and cooked. Season with some salt and pepper (2-3 pinches of salt suggested). When nearly ready add the fresh fenugreek. Add the cheese when filling the pancake in the pan and whilst the second side is cooking. 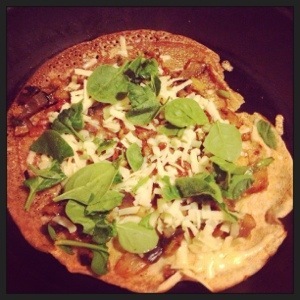 You can optionally add some fresh baby spinach leaves when filling the pancake. This is enough filling for four small pancakes. Add all ingredients (not the butter) and whisk to mix well. Let the batter sit in the fridge for 20 minutes or until you prepare your fillings. Melt enough butter to coat the pan’s surface. Add about a ladle full of batter in your pan. Lower the heat and cook for a minute or until ready-that’s when it’s easy to flip. Flip and whilst the pancake is cooking fill with preferred filling and cheese , or fruit and chocolate. Fold in four in the pan. This amount of batter should give you six small pancakes and plenty for two people. This should help you flip the pancake easier. This entry was posted in Recipes, Vegetarian and tagged aubergine, fenugreek, food, food photography, lifestyle, Pancake, photography, recipe, wholemeal flour.